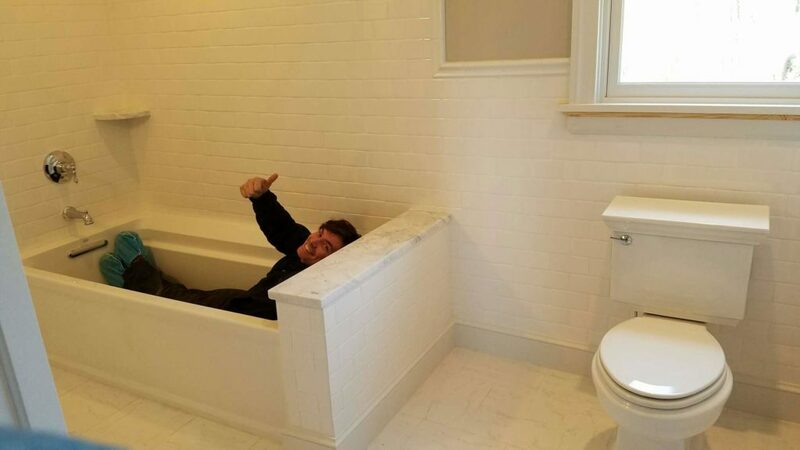 Glen Allen HVAC and Plumbing | Carroll Plumbing & Heating Inc.
You can’t blame Joey for wanting to spend time in this luxurious soaker tub that he helped install in Glen Allen, VA as part of a bathroom renovation – the space is absolutely beautiful! Now this Henrico County homeowner can rest assured that their new tub is as functional as it is lovely. Master bathrooms should be a relaxing retreat—and for most people it’s not complete without a nice, large soaker tub to unwind in at the end of the day. Luckily, at Carroll Plumbing & Heating Inc. we’re skilled at making the most of your bathroom space. Whether you want to create room for a large soaker tub, or upgrade your old bathtub, our plumbing technicians understand how to maximize valuable square footage. From custom walk-in showers to free-standing tubs, your master bathroom should be everything you want it to be. At Carroll Plumbing & Heating Inc., that’s what you get! If you’re looking for expert plumbing installation in Richmond as part of a bathroom renovation project, contact us today.